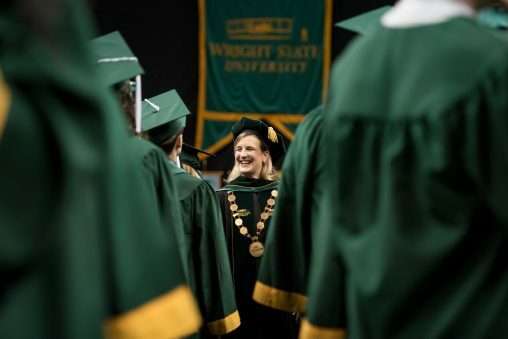 More than 2,000 students graduated during 2018 spring commencement ceremony April 28 at the Wright State University Nutter Center. The class of 2018 includes graduates with 1,429 bachelor’s degrees and 602 master’s degrees, 15 doctorates of philosophy as well as those awarded associate degrees and post-master’s certificates. The class features graduates from 66 Ohio counties, including 1,461 from the 16 counties anchored by Wright State’s Dayton and Lake campuses. Graduates hail from a total of 27 states. The class also includes 202 international students from 34 different nations. The Lake Campus held its spring commencement on April 27, recognizing 148 graduates. During the ceremony at the Nutter Center, Schrader encouraged graduates to think and act like entrepreneurs. “Be self-disciplined and persistent. Have a clear sense of direction. Be decisive and action-oriented. And always conduct yourself with integrity,” she said. She also told the graduates to remember they graduated from a university founded on innovation and named after two great inventors, Orville and Wilbur Wright. At spring graduation, Wright State awarded an honorary degree to Dayton native Margaret Peters, whose teaching, writing and activism have had a profound impact in advancing civil rights and the field of African-American history. During her remarks, Schrader highlighted achievements by members of the class of 2018, noting that students excelled inside and outside the classroom. “You have demonstrated outstanding leadership and a commitment to public service,” she said. She praised the Wright State Model United Nations team, which for the 39th consecutive year took home a top team prize at the national Model UN Conference; and the university’s student-athletes, who have graduated at the highest rate ever — 88 percent and 87 percent over the last two years. 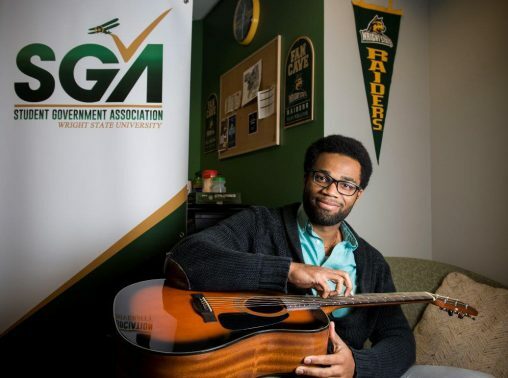 Baugham served as president of the alliance’s Wright State chapter and was appointed to the student council of the Nonprofit Leadership Alliance national organization, raising the visibility of the campus program nationally. “What I would like to do is combine my knowledge of supply chain with my love for the social sector and nonprofits and be able to use that to work as a project manager or director of a global relief organization such as the American Red Cross,” said Baugham. Baugham has interned and worked at Good Samaritan Hospital. He and his parents have also worked as simulation patients at the Wright State Boonshoft School of Medicine, helping train medical students by pretending to be sick patients or their family members. Baugham is active in student leadership. He served as director of academic affairs for the Student Government Association, then speaker of the House and, most recently, president. He also has musical talent. He was the 2013 winner of the “So You Think You Can Play the Schuster?” regional arts competition, using his prized guitar to outperform more than a dozen finalists on the stage of the Dayton theater. After graduating, Baugham plans to pursue his master’s degree in public health in the Healthcare Management program at Yale University. 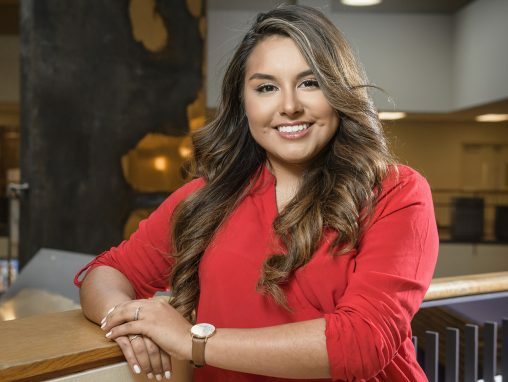 Stephanie Patino-Garfias, who is majoring in political science and international studies with a minor in Arabic, is an activist in the areas of immigration, social justice and human rights. When she was a freshman, she helped raise money for the families of 43 students from a teachers’ college in Mexico who were kidnapped in 2014 and feared to have been killed. She met with two of the family members and gave them a $1,000 donation that had been raised in three weeks at Wright State. Patino-Garfias was selected for a 2017 Newman Civic Fellowship, a prestigious national program that seeks to develop a new generation of leaders who can build relationships and bridge differences to address inequality and polarization in the nation’s communities. As part of the fellowship, she met with immigrants from Guatemala, El Salvador and the former Burma, now known as Myanmar. She actually accompanied an immigration attorney into the fields and spoke to farmworkers about their legal rights. She later created her own outreach program and went into the schools to talk about immigration rights. She also gave a “Know Your Rights” presentation to immigrants at the Mexican consulate when it held office hours in Dayton. Patino-Garfias has studied abroad in India and Morocco, where she helped feed Syrian refugees. This summer, she will take part in an internship program in Washington, D.C., sponsored by the Institute on Economics and International Affairs designed for people interested in the Foreign Service or working on international policy issues. 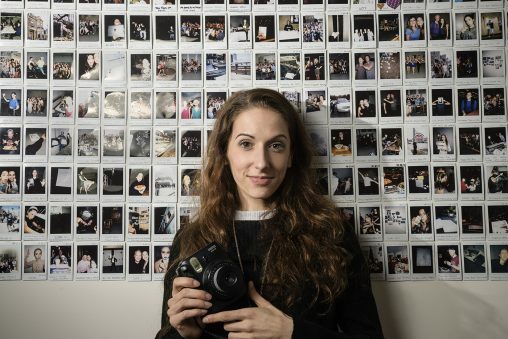 The memories grip the wall of her apartment bedroom — row after row of snapshots. More than 400 in all. Valle has taken a photo at Wright State nearly every day since Aug. 27, 2015, when she arrived on campus to begin her sophomore year. As a result, she has a colorful, growing photographic tapestry of her final three years at the university staring back at her. At Wright State, Valle has performed in about a dozen productions, including “Peter Pan,” “Chicago,” “A Streetcar Named Desire,” “Miss Mayor,” “No, No, Nanette!,” “Children’s Hour,” “Fiddler on the Roof” and “The Mystery of Edwin Drood.” She has taken dance and acting classes, done some directing and choreographing and wrote her own one-person show.